So the first season of Santa Clarita Diet proved to be pretty interesting and showed a lot of potential despite a few pacing issues and some confusion over its actual drama. The show plays with elements of comedy, horror and a little family drama but wasn't always certain in how to present things. This second season of the show felt a lot more sure of itself and had a much clearer vision of where it wanted to go. And apparently that direction involved the same sort of thinking that probably spawned franchies like Beetlejuice or maybe Pushing Daisies. But man that craziness and willingness to embrace absurdity in the name of comedy really paid off and I loved this season even more than the first one. And with all the twists and turns it seems that the show has even more to show us beyond this second time around the block. And I can't wait for another season to come along. 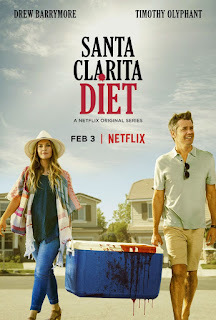 Synopsis: Santa Clarita Diet is an American horror-comedy television series created by Victor Fresco for Netflix. As of the time of ths blog review the show has been confirmed for a third 10-episode season in 2019. The season begins with the family in an odd place. The promise of a possible cure has resulted in Joel (Timothy Olyphant) subject to a 72-hour hold in a mental institution. Sheila (Drew Barrymore) is still chained up in their basement despite the neeed to address her real estate clients. Their daughter Abby (Liv Hewson) is working with Eric (Skyler Gisondo) to source pure Serbian bile to complete the cure. And it turns out that there may be more people with the same undead condition that Shiela is suffering. As things get settled a better part of the season is about Joel and Shiela trying to figure out how to advance their careers despite the limited view of their boss and the complications of Shiela's need to consume human flesh. In the meantime Abby seems to be going deeper and deeper into a more cynical, pragmatic place where she no longer trusts in authority all that much given how her parents are still getting away with murder. Eric tries to temper this but he also has to juggle the unusual affections of Ramona (Ramona Young), the creepy quiet girl who also seems to eat people. What I Liked: This season is super funny and a lot of it is tied to the absurdity of the situations that the family gets into. Whether it's trying to figure out how to hide the latest body or Abby's unusual altercations involving other students in school, everyone seems to be off the rails this time around and it pushes them into interesting yet still rather strange directions. And as they embrace just how crazy it is to have a family member who is essentially an undead zombie with a need to feed on humans, the storytelling gets even better. And it's not just all funny situations but also a lot of decent world-building behind how things came to be. We get a lot more possible information on the back story of things and how Sheila and the others were turned into this human flesh craving individuals. Of course any good series ends up creating more questions than answers over the course of the show, I generally felt satisfied with what we learned this time around. What Could Have Been Better: There's a sort of b-roll plot involving another group involved in this whole mess. While it does seem they are determined to clean things up and stop the continuing spread of this undead infection, we really don't get enough time to better understand their movies or appreciate what they're doing. Sure, they're very "shoot first, ask questions later" but on the whole that still doesn't mean we can't learn more about them outside of whatever research Eric manages to dredge up. I am also curious as to the very small role that law enforcement has played in this series outside of named characters like Anne Garcia (Natalie Morales), who is really more of a love interest character for neighbor Lisa (Mary Elizabeth Ellis). There have been a lot of deaths not just because of Sheila but also because of the other zombies in the area and yet it doens't seem to be a major concern for the police. Sure, in reality various murders and disappearances like this could theoretically not really make headline news all that quickly nor would the police immediatly associate them to one another but really, I think we should have more police heat by now. TL;DR: The second season of Santa Clarita Diet is definitely a lot more focused and crazily funnier than the first one and that really shows they're getting a better handle of what they want to do with this show. Things keep getting crazier and crazier and yet you can't help but admire how our protagonists continue to roll with the punches and response to each new challenge or obstacle thrown their way. Thus the season gets an awesome 5 characters who turn out to know a lot more than you expected out of a possible 5.